By Robert RizzutoDemocratic U.S. Senate hopeful Elizabeth Warren is facing new criticism from Native Americans over her heritage claims as a nearly three-decades old family cook book called "Pow Wow Chow" has surfaced. Warren, who is working to gain the Democratic nod to take on Republican U.S. Sen. Scott Brown in November's general election, has been under fire for several weeks as Brown's campaign and others have questioned whether she used family stories of Cherokee ancestry to further her career through affirmative action programs. Although Warren, a Harvard Law School professor, has repeatedly denied such claims, and the universities that previously hired her released statements saying they weren't aware of such heritage claims or that they played no part in her hiring, the specter of such allegations has lingered. 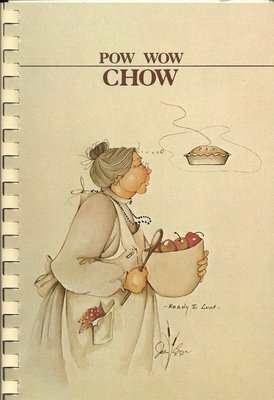 This week, the "Pow Wow Chow" cookbook, which includes recipes contributed by Warren and family members, was obtained by the Boston Herald, documenting that Warren has identified with her family lore of Cherokee ancestry as far back as the early 1980s. The book is a compilation of “special recipes passed down through the Five Tribes families,” according to the Herald, which mentions Warren's recipes for savory crab omelet and spicy barbecued beans.Comment: Another posting says Warren signed a couple of the recipes as "Elizabeth Warren, Cherokee." As with the professional directories, we could write this off as a youthful (or middle-aged) indiscretion. We could say she was exploring her Native identity, trying it on like clothing to see how it fit. But the more she listed herself as "Cherokee" or "Native" in writing, the stronger becomes the burden of proof. She knew or should've known that describing herself as a minority would influence hiring decisions, especially in academia. You shouldn't claim an ethnic identity in public unless you're sure of it, because it'll affect how people view you. And yet she didn't have anything except family stories to justify calling herself "Cherokee"? Her closest Native ancestor was at least five generations removed? That sort of identity claim is suspect, to put it mildly. My family claimed an ancestor who came over on the Mayflower, and another ancestor who signed the Declaration of Independence. The first claim proved to be true, the second probably false. The point is that I never mentioned these possible connections in any official capacity. Rather, I treated them as what they were: family rumors or gossip. Before I knew for sure, there's no way I would've listed myself as a Mayflower descendant. Someone might've taken it for a factual statement, and that would've been wrong. For more on Elizabeth Warren, see Warren Has No Firsthand Evidence and Warren Didn't Claim Native Status.